Although I arrived a bit later than comfortable, I found myself just in time for the main show. The lights dimmed suddenly and Kyary Pamyu Pamyu appeared on stage with her coterie of back dancers and DJ Vegetable (more later). 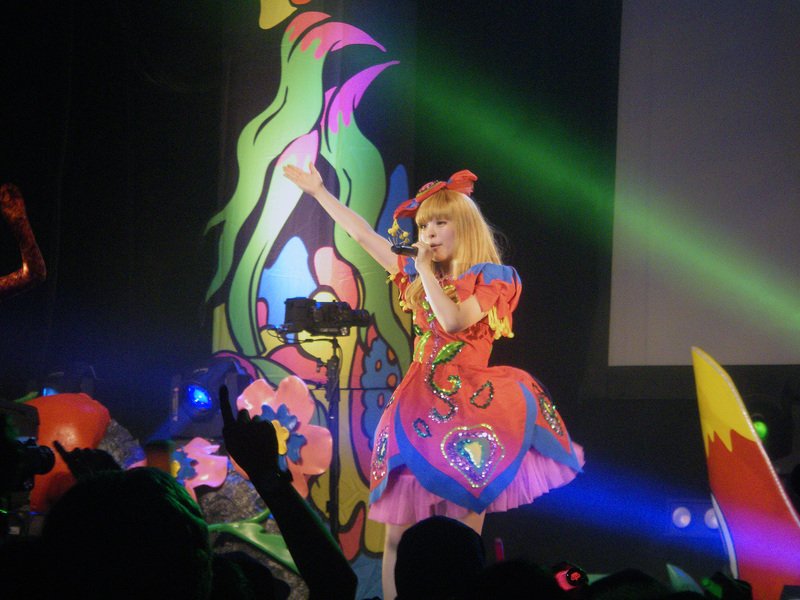 Wrapped in a red mini-dress splashed with blue hems and epaulettes and crowned with floral bow bigger than her head, Kyary Pamyu Pamyu dressed the part of the Fashion Monster who stormed onto the J-Pop scene five years ago. 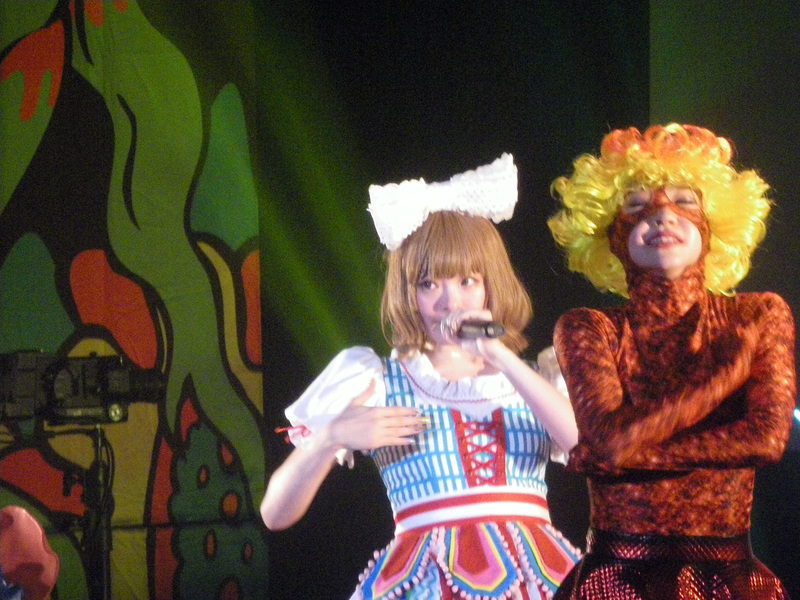 Kyary Pamyu Pamyu brought 5ive additional performers on this particular tour. Four dancers added pop and tightness to the choreography. As always, the dancers wore elaborate costuming, wigs, and face paint that completely obscured identity. The enthusiastic DJ named fittingly “DJ Vegetable” worked behind the flower petals dressed in green as though he was also part of the flower. 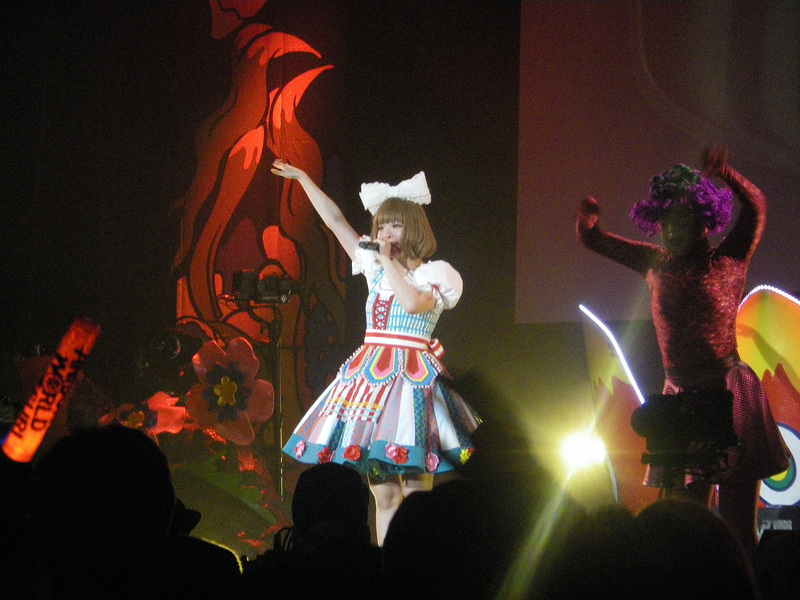 The long-awaited Kyary began our night with “Cosmetic Coaster” and “5IVE YEARS MONSTER” whipping quickly from one song to the other. 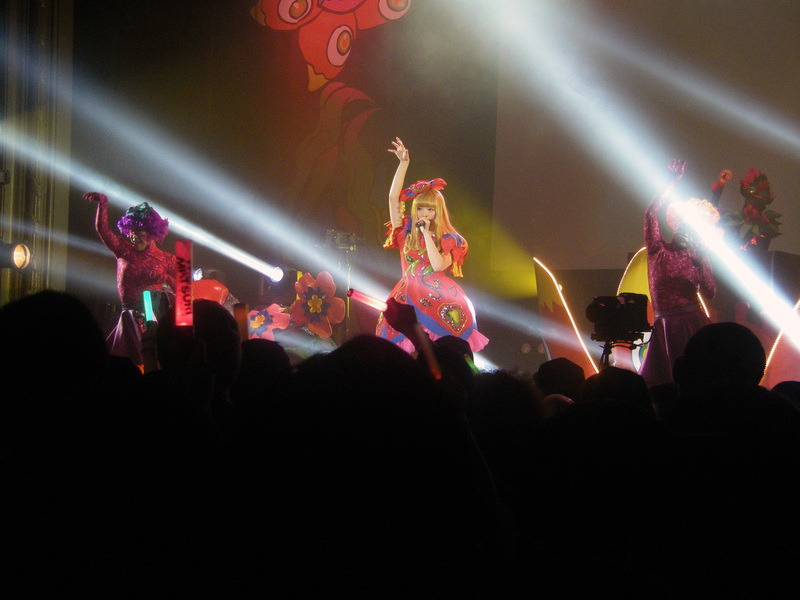 The drum cadence of “Kyary AnAn” beat the audience into shape with its near-mandatory crowd-participation. With a couple of songs under her belt, the concert really took a full swing and hit with popular classics like “Cherry BonBon”, “Furisodeshon“, and “Candy Candy“. 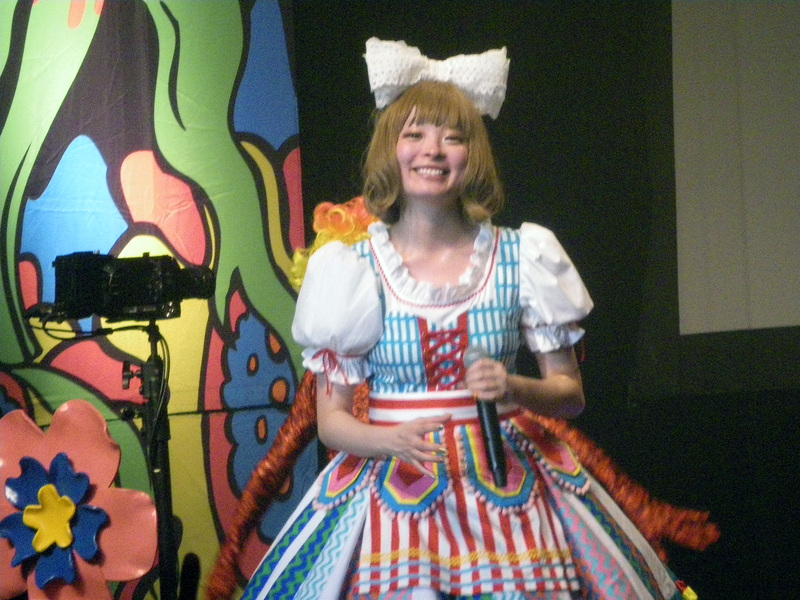 By the time she performed her signature “Pon Pon Pon“, the audience was reminded of why they all fell in love with Kyary Pamyu Pamyu. The refreshing breeze of youthful exuberance and a healthy disregard of conventional wisdom (and taste) blew the stagnant air of the Regency Ballroom away. 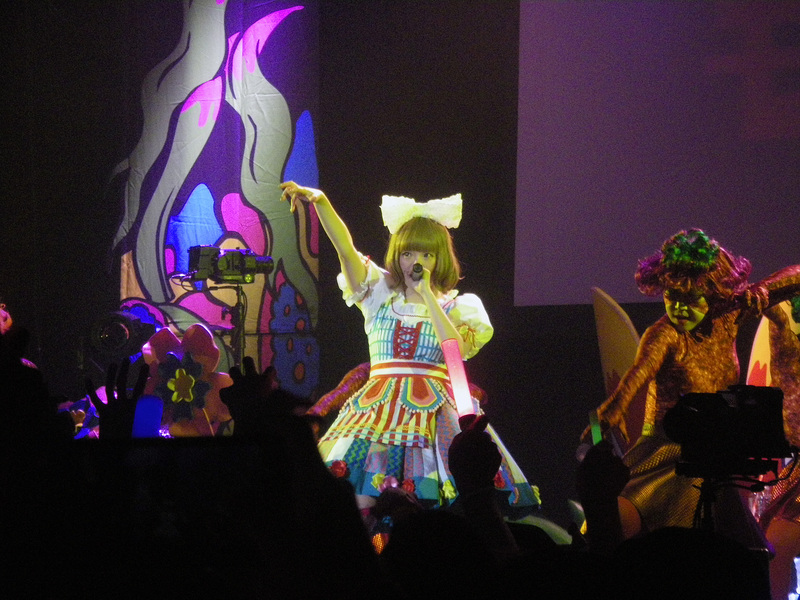 Kyary reigned supreme as the queen of J-Pop Harajuku style for this night- only the young and young-at-heart were welcome. 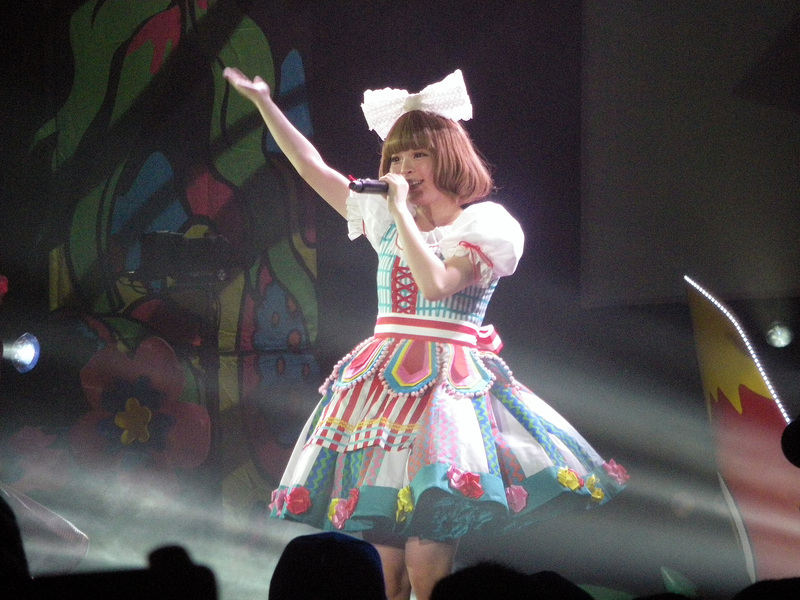 After a quick costume change, Kyary returned to the stage in a dress reminiscent of Disney’s version of Alice in Wonderland. Blue and white dominant colors were this time accented by red flower petals along a high waist. 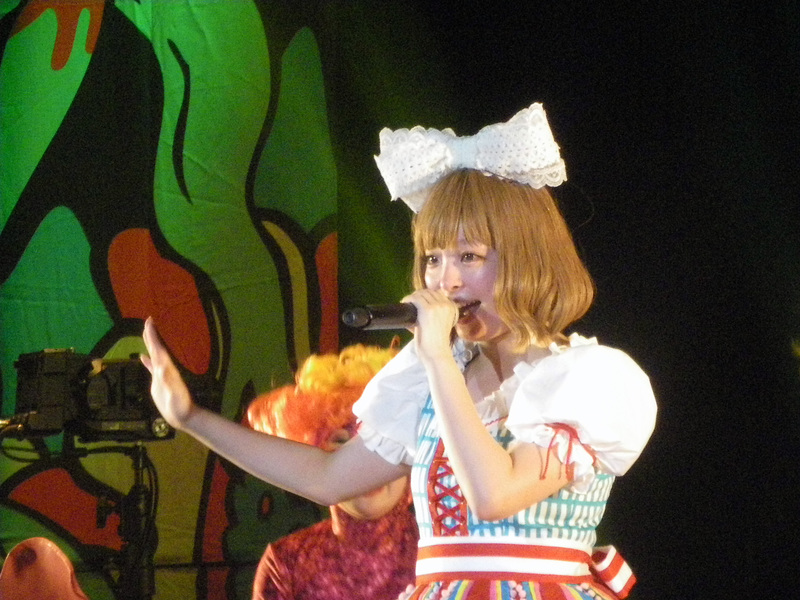 In true J-Pop fashion, Kyary donned the over-sized white bow atop her short cropped strawberry blonde wig. This second half of her set started with the thematically relevant “Fashion Monster and closed with her most recent single Sai & Co. Those expecting a single heavy set got their heart’s desire as Kyary Pamyu Pamyu’s on this night drew almost entirely from her KPP Best compilation. 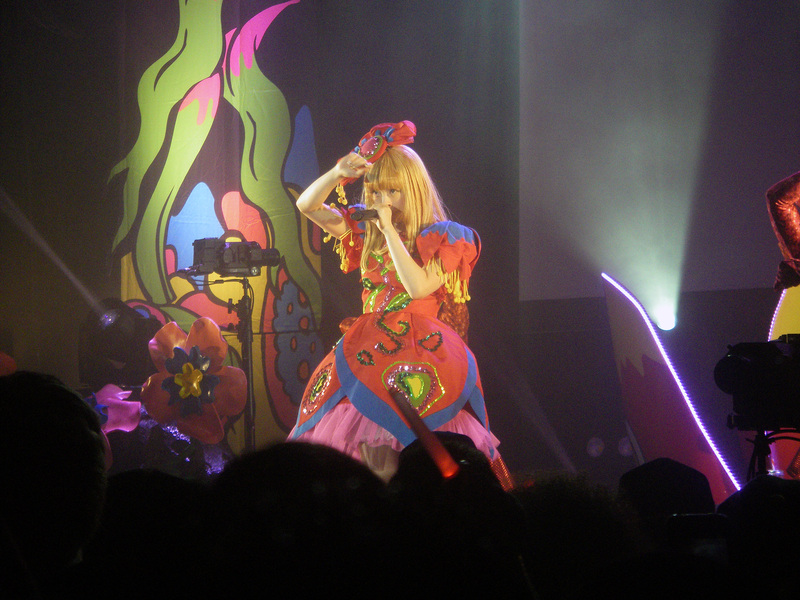 The production on most of Kyary’s singles use vocal effects and elaborate costuming, and her performance stayed true to the original vision of those songs. As much as this unique choice earns praise and piques the interest of the uninitiated, her heavily altered vocals provide an easy target for naysayers looking to discredit Kyary Pamyu Pamyu’s merit as an artist. As one who followed her career from its beginnings, I see no reason for the artist to implement some drastic change to silence critics. However, at this five-year junction in her career I wonder what, or if any, evolution or transformation Kyary Pamyu Pamyu will undergo when her backward glance completes this year. 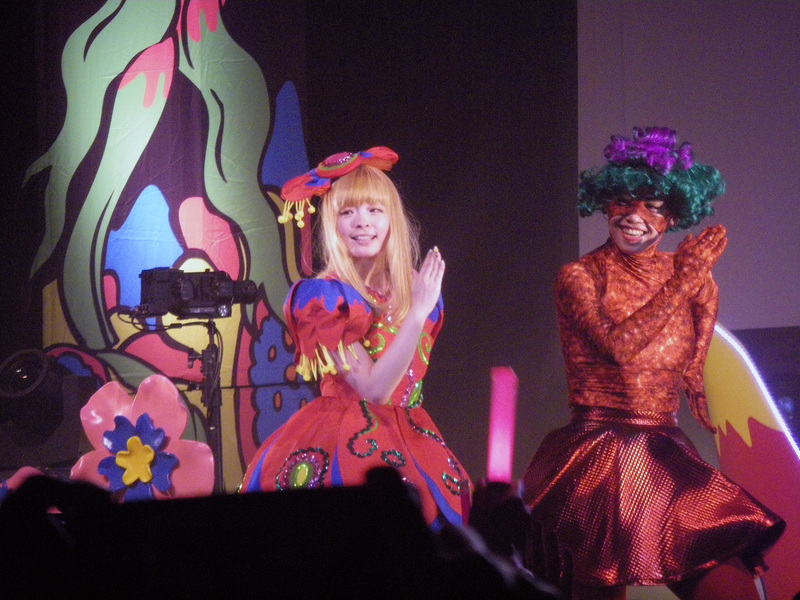 The performance drew to a close when Kyary reappeared on stage for her encore performance. 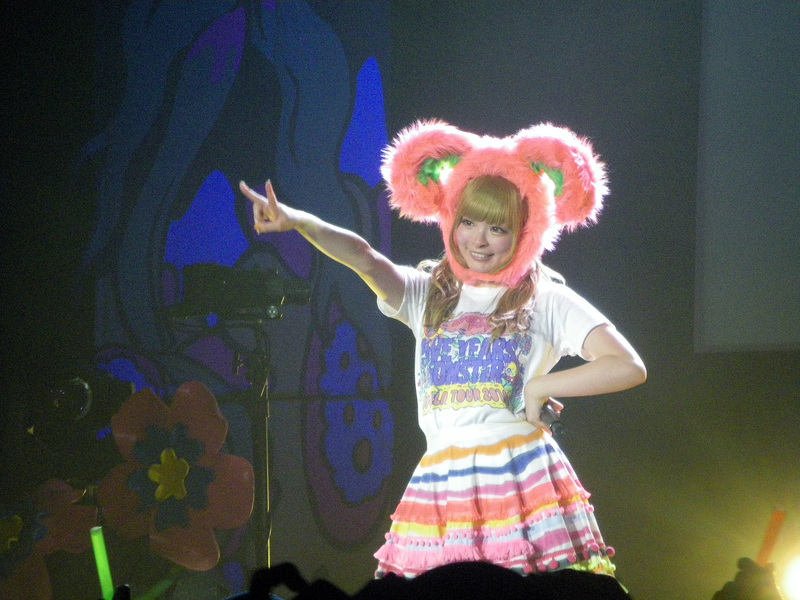 The final two songs saw Kyary wearing her white concert t-shirt and a pink rabbit ear headdress. In keeping with the Alice in Wonderland set, the artist revealed herself in her true form. While we all assumed Kyary Pamyu Pamyu was the Alice figure whose adventures we were witnessing, she was really the pink rabbit who led us all on our own personal adventures in her Pamyu Pamyu Wonderland. The Harajuku Fashionista ended the night with the author’s favorite, “Tsukema Tsukeru“. The song’s lyric about donning false eyelashes as a magic spell still held true on this evening. 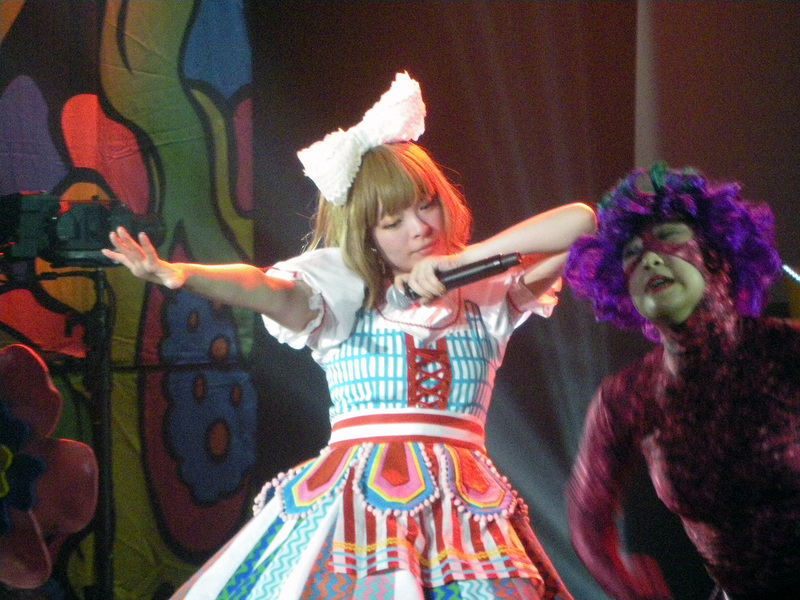 Finally, as Kyary Pamyu Pamyu mimed the closing notes on her invisible horn, the spell is complete. The pink rabbit may have led us down the rabbit hole, but the pied piper brought us out and begrudgingly back to reality.